Celebrate the opening day of Disney's Pirates of the Caribbean - At World's End with this Limited Edition pin. 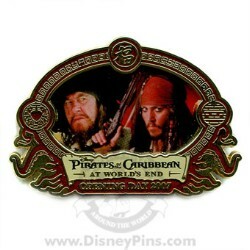 This pin features Captain Jack Sparrow and Captain Barbosa. This pin also features a pin on pin element.